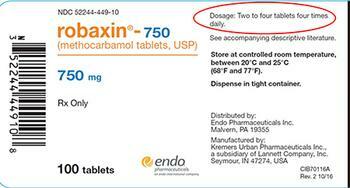 Endo Pharmaceuticals is recalling two lots of Robaxin (methocarbamol tablets, USP) tablets. The product label contains incorrect daily dosing information due to an error which misstates the daily dose as "two to four tablets four times daily" rather than the correct dosage of "two tablets three times daily." Robaxin 750mg, 100 Count Bottle pack, Lot 220409P1, Expiration Date: January 2021. Product Return: Upon contacting Inmar and indicating you have unused product, please expect Return Authorization labels and Shipping instructions. Product Reimbursement: Upon contacting Inmar, please be prepared to share proof of purchase. Proof of purchase can be sent to robaxin@inmar.com or 635 Vine St.Winston Salem, NC 27101-Attention Recall Department, Robaxin Recall. Consumers with questions regarding the recall may contact Inmar at (866) 391-0620 Monday through Friday, 9am to 5pm (ET) or by email at robaxin@inmar.com.